Nunavut's new Liberal candidate, former premier Paul Okalik, says he wants to make education one of his main priorities in the federal campaign. Nunavut's new Liberal candidate, Paul Okalik, says he wants to make education one of his main priorities in the federal campaign. 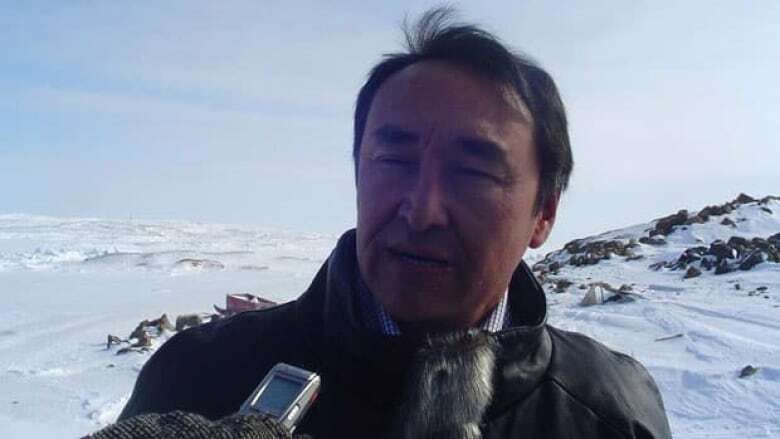 Okalik, who was the first premier of Nunavut, was confirmed as the territory's Liberal candidate at a nomination meeting Tuesday night. He is facing off against incumbent Conservative MP Leona Aglukkaq, who has been serving as the federal minister of health. Also running in Nunavut is New Democrat Jack Hicks, a social researcher who was confirmed as that party's candidate this past weekend. Speaking at a cold and windy outdoor news conference Wednesday in Iqaluit, Okalik said his decision to run came after a year of talks with the Liberals. "I looked at the platform of all parties. And as an aboriginal person, I looked at the Liberal platform and it focused on education. That's something true to my heart, and I want to see more of that," Okalik told reporters. "I looked to the Tory platform and I can't see anything, unfortunately. So I think we can do better, and that's why I'm presenting myself to my fellow citizens." A longtime territorial politician, Okalik was Nunavut's premier from 1999 until 2008, when he sought his third term as premier but lost to Eva Aariak. Before he submitted his resignation on Wednesday, Okalik was Speaker of the legislative assembly and the MLA for Iqaluit West. Legislative assembly officials say a byelection will have to be called in Iqaluit West, and MLAs will have to select a new Speaker. Okalik and Aglukkaq used to work together — Aglukkaq was finance minister, and later health and social services minister, in Okalik's cabinet until she resigned at the start of the 2008 federal campaign to launch her Tory run. Okalik, who has never run for federal office before, said he is not deterred by the fact that Aglukkaq holds a federal cabinet post. Okalik said the Conservatives have not addressed the issues of Nunavummiut, citing recent food subsidy changes and a ban on the export of Inuit-harvested narwhal tusks. "Yes, we have a cabinet minister, but our expectations aren't being met," he said. The election contest in Nunavut has become similar to the race in the Northwest Territories, where Liberal Joe Handley — a former premier — is up against Conservative Sandy Lee, the territory's former health minister. Voters across Canada, including those in Nunavut, will go to the polls on May 2.